For frightened rats, aggressive rats, biting rats, or just plain new shy rats; in fact for very calm friendly rats! What is a transport box? A small box that a rat can learn to love to hop into any time you offer it. It has an opening you can close as needed, and fits into your cage or cage door just right. When trained to use it, rats get downright eager to fly in any time you offer it. Below the videos is the written method to teach the rat, with important rules and great detail. Don't believe this can be helpful? Below the instructions are several more videos of rats who have learned the method well, showing off their skill. In this first of two videos, Ingrid Rat is a newly adopted, unsocialized rat, who just had one baby. She is maternally aggressive and very shy, preferring to stay hidden and to not interact with humans. For Ingrid, offering the box where she was inside a box inside the cage, was important. Ingrid also enters the box pretty quickly, after only a few offers, perhaps in part because her baby, Ed, is happy to go into the box and eat the treats. She has some social role modeling to teacher her that the box is safe. Quick entry is not necessarily going to be the behavior of every rat. After Ingrid is another rat who takes much more time entering the box, so you can compare different rats. What if the “Rat Won't Go Into the Box”? A second video of Gonzo rat, who has no interest in entering a box. He would rather explore and escape to the big wide world. And he cared nothing for food treats. The method in this case is patience, patience, patience. Don't worry if it takes many sessions over several days to help a rat feel good about entering a box. Whatever time is needed, is just fine. Gonzo had been owned for several months by an 11-year old child, when, at about age 6 months, he bit Iris and both parents, at odd time and seemingly out of the blue. Iris never really tried to socialize him, but even without that, Gonzo was very curious, bold and gregarious. While he doesn't want to be touched, and cares nothing for the box during this session, he was also eager to check me out and in general showed no fear. In this video Gonzo is NOT food-motivated. Some of my best treats are ignored. As it turned out he had been on a high-fat, high-protein, sunflower and other seeds diet, which resulted in my treats meaning nothing to him. Because he is not motivated by food, in my opinion the only thing that would attract him to entering the box, was the promise of “going out into the world” — which he spent most of his time in this session trying to do from every angle of the cage and table. The question to ask when working with a rat and teaching him to use a transport box, is, what is reinforcing for this particular rat. What does the human need to do, such that entering the box results in a reward for the rat? What is rewarding is different for every rat. The question to ask when working with a rat and teaching him to use a transport box, is, what is reinforcing for this particular rat? What does the human need to do, so that entering the box results in a reward for the rat, because it is rewarding the rat for good behavior like entering a box, that will result in the rat entering the box more often, whenever we offer the box. What is rewarding is different for every rat. In this second video we see different techniques in how the box is offered and how close the human can get, reflecting one difference between Ingrid in the first video, and Gonzo in the second. Reasons to use a transport box? Oh BABY! I cannot tell you how many times a transport box has worked for me, with aggressive rats, unsocialized rats, and escaped rats. A box (cardboard is common) with one entry hole. For rats who are a flight risk, the box opening may be limited to the size of the cage door opening; this way the rat has nowhere to go except inside the box. Otherwise the opening can be about the size of one or two rats. A size the rat is comfortable going into. The box has an opening you can block closed with one hand, and is about the size of one rat. It holds as many rats as you need it to. Consider if you need to hold it in one hand. Leaving it inside the home cage for several days, so that the rats become familiar with it, and putting used bedding or fleece inside it, is good preparation. My favorite: a large sized Kleenex box. 2. If the rat is aggressive, or you have not assessed her for aggression, wear gloves. If the rat bites your bare hand covering the box opening, you risk serious injury, as well as dropping the rat on the floor, risking injury or escape. 3. Determine where you will transport the rat: Have another cage or crate set up and ready. 4. Orientation: This is not a method to capture the rat, only to teach her that the box is pleasant and safe, and that she should want to go inside it. If the rat is a flight risk, put a treat in the cage to move her away from the door. First put cereal at the opening of the box. Let the rat “meet the box.“ Later the treat will be set further and further inside, finally reaching the back. Place the box opening at the door (block any remaining open part of the door opening). Do not move the box while the rat becomes acquainted with it. This may take a long time and several sessions..
Do not move the box while the rat moves in and out of it. This may take a long time. Allow the rat to go in and out of the box at liberty. Offer the box in many sessions, watching to see that the rat increasingly becomes comfortable going further and further inside. Once the rat is comfortable exploring the box, offer it with and without a treat, and extend the session periods. This may take 2 tries, or 25 tries, 5 minutes each, or 10 minutes, or 20 minutes, over several days. Patience is key, so that the rat has a pleasant, safe experience of the box. RESULT: Placing the box at the cage door will trigger the rat to come willingly and quickly to the box, and enter it. When she is comfortably staying inside the box for several moments, slide your hand (gloved if the rat bites) across the opening. Warning: Don’t underestimate the power of the rat’s nose – she may push through your fingers. As you move to the new cage, anticipate the rat will want to push through your hand, and shore up your block of the entry hole (use your hand or gloved hand). Move the shuttle box to the new cage, and position it at the opening. Make "one road ahead", into the cage. Insure that no escape spots are present. Depending on your cage, you may want to move your hand to the bottom of the box opening, position your open palm, and offer your wrist as a bridge or ramp. Repeat Part I in reverse: allow the rat to exit the box at her own pace. She will sniff the new area to determine safety or familiarity, or the presence of treats, and slowly exit. If she is reluctant to exit the box, put cereal on the cage floor. Leave the box in place at the opening and allow her to return, moving in and out at liberty. The box is safety from the new scary surroundings..
Use a box size that will fit easily through the cage door. Be able to maneuver the box around inside the cage. If you have a severely frightened rat, this can be the only box she has. You will want to minimize hidey spots so that she can focus on the box. Set up the rat to successfully use the transport box. At the beginning leave the box inside the cage for a few days. Watch to see that the rat begins to use it comfortably. Leave a small treat every so often inside the box. The goal is to show the rat, "this is what I want you to do when I offer you a box, and in fact you will have a great experience. There's something to look forward to." Move the box slowly towards her in a way that asks, "Here's a box. It has a yummy inside. I would like you to go inside the box.". If she is already inside the box when you begin, take advantage of this by sliding your (gloved or not) hand over the opening and remove it gently. Warning: Watch that the rat does not perceive you as trying to corner, chase, or push her by pushing the box at her. If you inadvertently frighten her or use the box aggressively (from her perspective), this may make the box experience more negative, and compromise altogether the transport box training. As you begin, the rat may move to another spot in the cage. Wait until she stops, and then slowly reposition the box near her. Stay as far back as you need to so that you see her interested and cautious, but not showing more fear. This could be 6 inches or 12 inches depending on the rat. If she moves again try repositioning the box 3-4 times only. If no success, leave it and the treat. Repeat later. If she stays in place and doesn't react fearfully, move the box a little closer. Pause for a few seconds and repeat. What to look for: When I've done this method, the rat usually eyes the box, thinks about my request, and when the box is just the right distance away, she will willingly move into it. At this point I slide my (gloved or not) hand over the opening and smoothly remove the box. Move the rat to the new cage, and set the box inside. Set a treat just outside the box. The rat may or may not leave it. If she doesn't exit after a few minutes, reverse the process and return the box to the original cage. Repeat this session until the rat begins to feel more comfortable. If the method is successful, begin to transition to Part I of this method. Luring helps early on. The rat smells the yummy treat inside the box (or in the new cage). The smell draws her to approach the scary box (or exit into the new cage). Result: By the presence of the treat, she is encouraged to approach and go into the box (or go into the new cage). Rat does a desired behavior, such as step into a box (or from the shuttle to the new cage). Rat promptly/immediately receives a reinforcement (sometimes called a reward, the treat you know the rat likes). Result: Rat behavior of stepping inside the box (or going willingly into the new cage) increases. Rat steps into a box (or into the next cage from the shuttle). Immediate reinforcement: Her Rat's curious nature means she wants to explore the new box (or the new cage). When allowed to do so at her own pace, she experiences this as rewarding. Later on, the appearance of the box at the cage door will signal "off to new fun adventures", which is another form of reinforcement. Result: Rat behavior of stepping inside and staying inside the box (or willingly moving into the new cage) increases. Allowed to approach the box (or exit the box into the new cage) at her own pace, she is exposed to the scary box in tiny increments. Repeated exposure to a scary thing this way causes it to loose its scariness. Result: Rat behavior of stepping inside and staying inside the box (or moving from the shuttle into the new cage, and staying there) increases. In this first video, if you have a fearful rat who hides in the cage, help her use a transport box and you'll have an excellent way to remove her from the cage without a fuss. Here's one video showing this method. Below it are other videos showcasing rats who are well-trained, using a box. 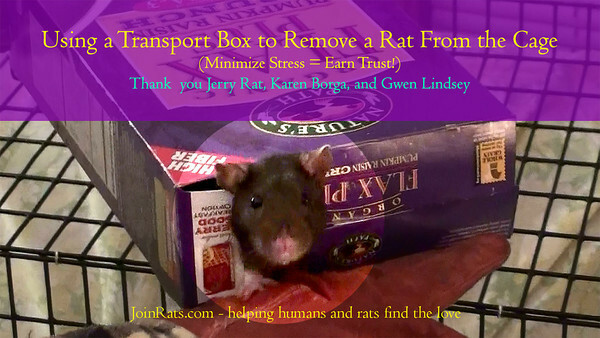 Karen Borga's unsocialized adopted lab rats are well-trained to use a transport box. In the first video Karen demonstrates with a pouch. The 2nd two videos use a box. Help rats love to hop into a box. Shy rats, aggressive rats, new rat mothers, loose rats, lost rats, every rat can love to hop into an offer box. 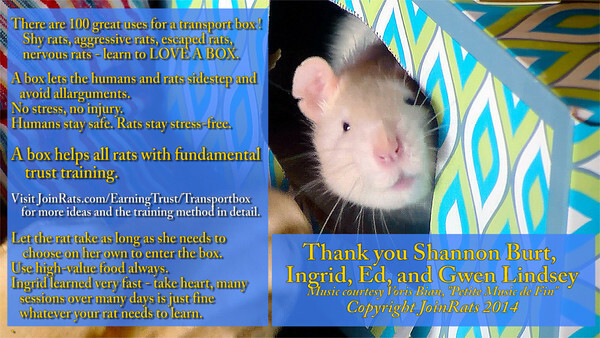 Ingrid rat, a new mom, a new rescue, who bites and draws blood, is helped to love a transport box for the first time. This will help her owner, Shannon, be able to work with her with no stress on either her or Ingrid.